I'm sending a Tica's picture to show you her eyes pigmentation. It's pink. I consulted her Vet and also her breeder and they said it's not a problem. 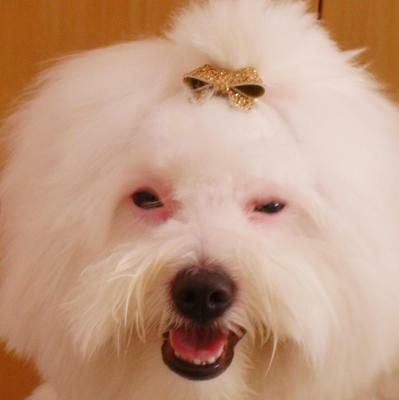 Other coton's owner is also worried about pink pigmentation, because the hot weather (he lives in Florida and I live in Brazil). Despite of Vet's opinion, I avoid to walk my dog from 9:00 AM TO 5:00PM, when is hotter. I saw this special dog sunglasses at internet. Have you tried this sunglasses in your coton? I noticed my Tica doesn't like sunlight, even in the early morning. Moriarty has patches of pink on his skin. You just happened to get a Coton that has the pink around his eyes. There shouldn't be anything wrong with him (physically that is, just luck of the draw), but I would follow the advice of others and your vet and keep him out of the sun for long periods of time, or if you do, put some sun tan lotion around his eyes, use the type that is safe for babies and doesn't irritate eyes. Thank you for your valuable comments.It showed me I'm in the right path!!! When we got our Chloe, we took her to the vet for a thorough examination. Our Vet told us right away that because of her color, white, and her pink pigmented skin we would need to be especially careful about having her out in the hot afternoon heat and sun. We are very careful especially in the summer and have had no problems. I've seen quite a few cotons but none that have eyes with the pink around them. I live in Nevada and in the summer its very hot and tempertures during the summertime is in the mid to high 100's. I dont take my dog out during the heat of the afternoon I get up early in the morning and take her out again just before noon and again when the sun isn't as strong. I feel all dogs shouldn't be exposed to high hot tempertures especially white dogs with pink light skin color.